The Sunday Telegraph today unveiled a new and possibly (given the results from South Carolina) short-lived political trend: Tories for Hillary. Apparently British Conservative MPs have been turning up at Democrat campaign offices, often uninvited, and offering to do their bit for the faltering Clinton campaign. Chelmsford MP Simon Burn recently spent nine days as a party worker for Team Hillary, canvassing by phone and standing on street corners holding up Clinton placards. I walked in and I said 'I want to see Hillary Clinton as president and I'm prepared to work in any way you want to try to help'. I said, 'Look, I'm British so the accent might not be helpful and I happen to be a Tory MP'. For those who understood what a Tory MP was politically, they were very good about it. Other pro-Clinton conservatives include Alan Duncan and Norine Davies, who said: "She's a woman with a lot of substance and experience. It will be great to have a woman as president." Several other female Tories are said to share her sentiment. At first sight, a Conservative-Democrat alliance looks like an oxymoron. Surely the Tories are a bit like the Republicans (without the "republic" bit, obviously) and Labour are our Democrats? It has often seemed that way. The decade-long love-in between Reagan and Thatcher casts its shadow, while long before Blair-Bush there was Clinton-Blair. For New Labour in the early days, Clinton's White House was like the promised land, where they earned their campaign colours and imbibed the mantras of the Third Way. The Major-Clinton relationship, meanwhile, was notoriously bad. Clinton never forgave the Conservatives for their open support of George Bush the Elder during the 1992 presidential election, and differences over Bosnia and Ireland led to repeated outbreaks of frostiness. In his memoirs, Sir Christopher Meyer recalled an uncomfortable dinner at Georgia Brown's restaurant in Washington, during which the president and the prime ministier "barely looked at each other, or exchanged a direct word, addressing instead the rest of us around the table." Yet the political compass is set very differently on this side of the Atlantic. Gore Vidal once memorably compared the Democrats and the Republicans to "a single party with two right wings", and in many ways almost all American politics is to the right of almost all British politics. A supposedly liberal Democrat might well find himself articulating positions that, transplanted to Britain, would look startlingly right-wing. There's far more enthusiasm for capital punishment in the Democratic party than in Cameron's conservatives, at least publicly. And every Tory government, no matter what its rhetoric, has dutifully pumped ever-increasing sums of money into that bastion of socialistic provision, the National Health Service, an institution for which, among Americans, probably only Michael Moore has any time. Then there's the uniquely American phenomenon of the Religious Right, which to almost all British conservatives, whether neo-liberal free-marketeers or law'n'order authoritarians looks to be simply poor taste. 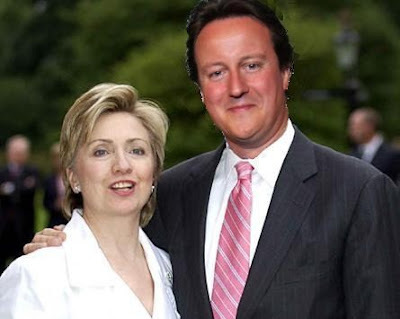 Maybe it's perceived as a bit odd for a Tory MP to want to support Hillary Clinton but the Republican Party has moved so far to the Right and has been captured by a rather unpleasant religious agenda, and the Tory Party under David Cameron is not equivalent to that. I have nothing in common with them and I wouldn't have thought many of my Conservative colleagues had either. The blood-brotherhood between Tony Blair and George Bush has also lent distance to the Conservative-Republican relationship. When the previous Tory leader Michael Howard criticised the Iraq war, it was made clear that he would not be welcome at the White House. In November 2005, David Cameron declined to say whether he would have supported Mr Bush or John Kerry at the last presidential election. The following September, on the fifth anniversary of 9/11, Cameron annoyed the hell out of the Americans by talking of the need for Britain to have an independent foreign policy. He declared that Britain should not be "America's unconditional associate in every endeavour" and described the Bush foreign policy as "simplistic", characterised by "easy soundbites" and lacked "humility and patience." Things had thawed enough by last November for Cameron to be invited to meet Dubya briefly at the White House, in what was seen by some as a sign of Republican lack of enthusiasm for Gordon Brown. But Cameron is keen to keep his options open. According to an unnamed senior Tory source, "he likes the fact that some of his MPs are Democrats. In the end it's the big picture that counts for him and if it's Hillary he will make it work." Conservatives supporting Obama - Obamacons, as they were dubbed by Conservative Home - are easy enough to understand. Barack Obama is an eloquent, feel-good politician very much in the Cameron mould (the unkind would compare him to Blair), and his ethnicity, coupled with his distance from the traditional politics of race, is a perfect fit for the inclusive cuddliness of the new Tory brand. As somebody who would naturally tend to support the Republicans in this election I in fact would feel that we really need a Democratic president probably because there has to be - the thing I really notice about political history in democracies is just the basic need to get one lot out and the other lot in. Conservative Home sounded a note of caution, however. "Conservatives are practical people and should be weary of anyone so inexperienced," the blog warned its readers, adding that it was sticking with the Republicans. Many of the contributors to the comments column shared some of this Obama-scepticism, but many did so regretfully, citing his lack of experience and policies rather than any more ideological opposition. Hillaricons, on the other hand, would seem to be a much stranger phenomenon. Bill Clinton's closeness to Blair was a highly political one, based partly on a shared hatred of the Conservatives. He has addressed Labour Party conferences, and has been a prominent advocate of "third way" politics around the world. It was Clinton who granted US visas to a still-unrepentent Gerry Adams and Martin McGuinness, much to Major's fury. If anything, it's Hillary who's been more associated with ideologically left-of-centre politics, or whatever passes for that in the States, while Bill's philosophy has generally been assumed to be more about Bill. Add to that the cynical and professionalised politics of the Clinton machine, whose smear tactics have so far backfired spectacularly, and it's quite difficult to see what these Tories see in Hillary. Perhaps it's just the still-potent Tory addiction to defeat.